Are you a super saver? Have you managed to contribute the maximum amounts allowed into your 401(k) or individual retirement accounts? If so, you may now be wondering what to do with any additional money you have. Should you continue to invest? If so, how? Should you spend it on a Picasso painting or give it to your kids? There are many options for people who have maxed out their retirement contributions. Here are some of them. I'm a huge fan of the tax-advantaged nature of retirement accounts, but regular taxable brokerage accounts have their good qualities. For one thing, they are more flexible than retirement accounts. 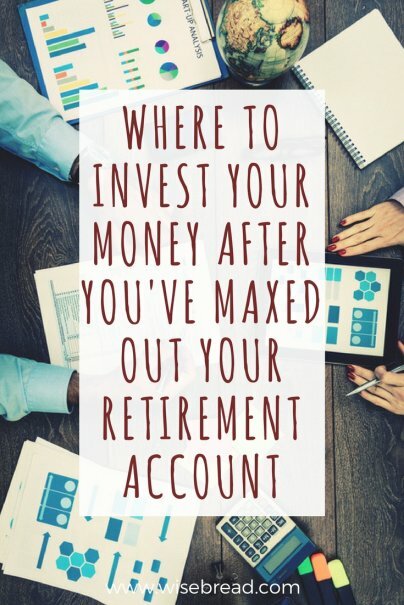 There is no limit to what you can invest in a taxable brokerage account, and while you will pay tax on any dividends and capital gains in these accounts, there is no additional penalty for withdrawing money before you retire. If you collect dividends from investments in a taxable brokerage account, they can be a great source of extra income. If you've put as much money into retirement accounts as you can, why not take a look at buying a property or house as a possible investment? Real estate can appreciate in value just like stocks, and you may even be able to draw income from tenants as well. Investing in real estate is obviously different from investing in stocks or bonds. In this case, you are investing in actual property. There may be more costs upfront, and you may face the expense and work associated with managing it. But there are many people who have gotten wealthy by buying and selling properties. Did you know it's possible to make money directly off other people's borrowing? With peer-to-peer lending, an individual can use an online platform to purchase someone else's debt and make money off the interest payments. The money you can earn is based off the riskiness of the loan; more creditworthy borrowers will pay out less than those with worse credit. It's actually not uncommon for people of high net worth to have cash flow problems, because they focus so heavily on investing their money. If you are maxing out your retirement contributions, you're doing great. There's really nothing wrong with having more cash on hand than you may need, and you may find that it gives you some nice peace of mind. You may think that once you've maxed out your retirement contributions, there are no more tax breaks to be had. But you can get a tax deduction for donating to most charities. So you can feel good about supporting a worthy cause while helping yourself financially. The one caveat here is that under the new tax law, it may be financially smarter for people to take the standard deduction rather than itemize. This could make donating to charity less advantageous from a tax perspective. If you are very wealthy and expect that your children or other family members will inherit your money when you die, it may be a good idea to begin transferring that wealth now to avoid taxes. Under the new tax law, the exemption for gift and estate taxes — the amount you can give away in your lifetime — is $11.2 million per individual. Married couples can transfer double that amount, or $22.4 million. It's also possible to make an annual gift of up to $15,000 per person (married couples can gift $30,000 per recipient) without paying taxes.